Leading the industry with quality products such as Wonder-Under and new Legacy Quilt batting. On the Go Bags + Giveaway! Hip, hip….hooray! On the Go Bags—15 Handmade Purses, Totes & Organizers releases this month! 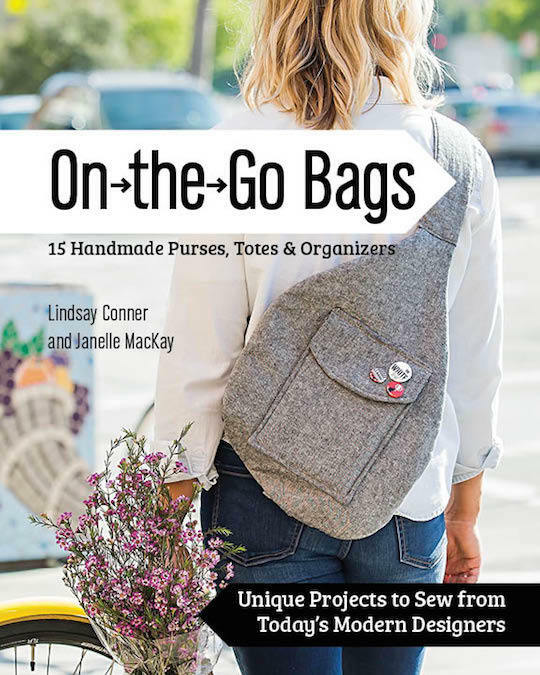 We have been eagerly awaiting this book, co-authored by Lindsay Conner and Janelle MacKay, which features more than a dozen original, multi-use bag and organizer patterns that will help you keep the essentials at an arm’s reach. So, whether you’re headed to work, running errands, on vacation, or just trying to keep it all together at home… there’s something perfect for you! The contributing designers from the book include some names you’ll recognize from the Pellon Projects portion of our site. Read to learn a bit more about the projects and for your chance to win the book! First, let’s ask co-authors Janelle and Lindsay a few questions to get to know them better! 1) If you were on a desert island and could only take one Pellon product with you, what would it be and why? JM: Pellon Thermolam Plus, because I will be able to use it to make beautiful, dense, interlining in all of my bag projects. It’s not too thick to sew through, but creates a very substantial feel to the project. I would take only fusible though, because it stays in place, and I’m sure Gilligan will have an iron there anyway. LC: Definitely ShapeFlex. I’m in love with this stuff for making bag panels from quilting cottons. It gives just the right amount of weight, and is really great paired with Thermolam. Since I’m also a quilter, I even used it to back the panels for a T-shirt quilt, and it worked wonderfully! 2) What project from the book are you most looking forward to making (or sewing again)? JM: I need all of the projects from the book, have made many, and plan on making them all. And first on the list is a Travel Toiletry Roll. I’ve got a trip planned to Quilt Market in the Spring, and this will be necessary! LC: I’m on my fourth Sporty Strap Pack (one-shouldered backpack), and each time I make it, I am having fun personalizing it with extra little details and contrast pockets. I also really want to make a Shopping Cart Caddy to hold my phone, shopping list and keys while I’m out getting groceries! 3) What’s your favorite guilty pleasure to enjoy while you’re sewing? JM: I love to have a nice cold beer with me while I’m sewing. I find my sewing room gets so hot with that iron going, a cold beer to sip on is so refreshing. LC: Salt & vinegar potato chips! Lately, I’ve enjoyed listening to an audiobook on my laptop, although I tend to miss a few paragraphs while the sewing machine really gets whirring. Can you imagine using some of our new Flex Foam in this Padded Camera Bag Insert from the book? In addition to the projects, you’ll learn some great bag-making techniques to get a professional finish. We’ve also spotted lots of projects that are great with a lightweight interfacing such as ShapeFlex, a heaver stabilizer like Peltex or a fusible bag shaper like Thermolam Plus. Don’t forget to follow the rest of the blog tour for more giveaways! Would you like to win a copy of On the Go Bags? Leave a comment on this post telling us what style of bag is most useful in your everyday life and why. Giveaway ends 12/15 at midnight EST, and we’ll choose one random winner. U.S. winner will receive a hard copy, and winner outside the U.S. will receive an e-Book. The absolute best part about this little blog tour of ours is getting to see all of the different ways that designers are using our Fusible Flex-Foam™ products. 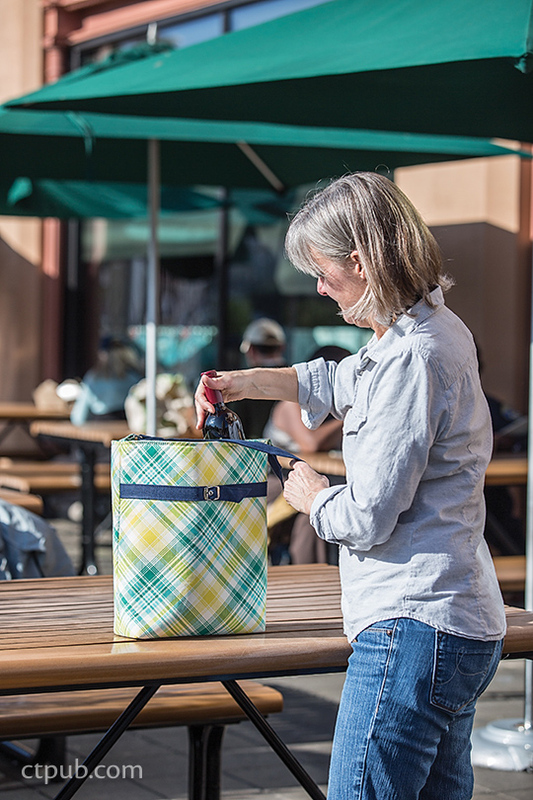 From handbags to organizers, clutches to changing pads, zipper pulls to baskets… Wow!! You all are amazing:). Today’s feature project comes from Lisa Swenson Ruble of Love to Color my World. A mom to three, Lisa is no stranger to the diaper bag and the sheer volume of things that get toted around on a day-today basis. 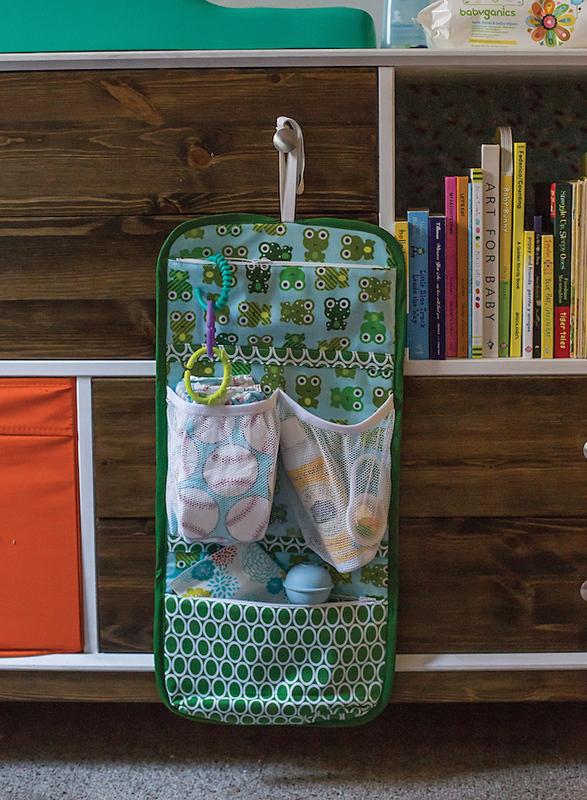 When she first received the Flex-Foam samples, her mind went immediately to a Grab-N-Go Changing Pad — something small and stylish that could be used in place of a bag full of supplies. We love it and as a mom to a 2-year old with one on the way, I’m particularly smitten. I’ll absolutely be making one of these!! 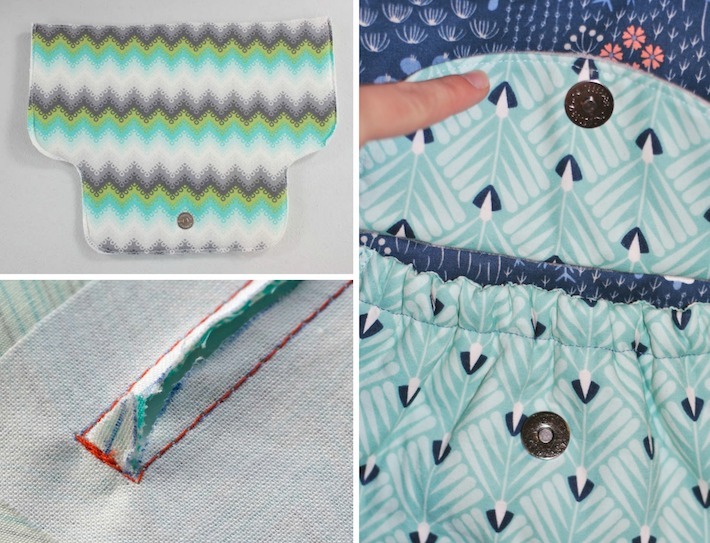 Sew a simple changing pad to carry with you when you don’t want to lug the whole diaper bag! 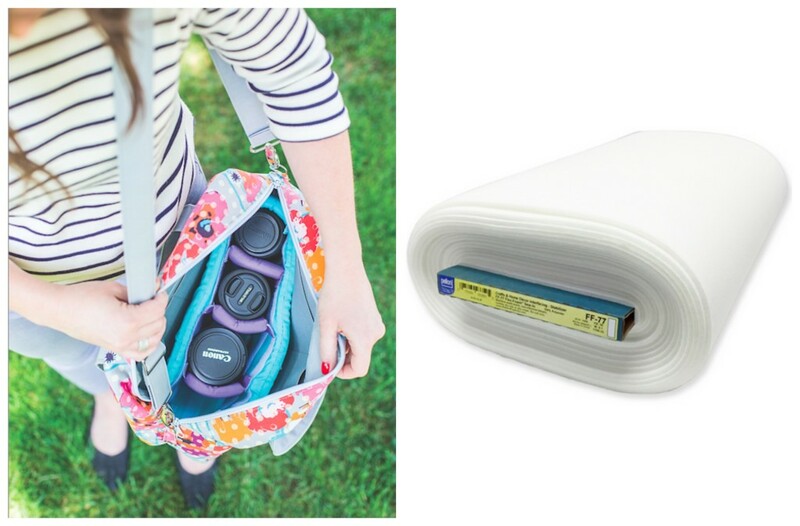 An outer pocket will hold travel wipes and a diaper or two. Fusible Flex-Foam holds this changing pad together and makes a comfy surface for changing the baby. Sample used fun and trendy prints from Benartex‘s Safari Playground collection by Greta Lynn for Kanvas– modern circles on the outside for mom and a fun zoo-themed print on the inside for the little guy! Lisa Ruble blogs under the name Ellie Q over at Color My World. She frequently gives up sleep to sew and/or bribe her toddlers with watching cartoons when an idea hits, and she has a ridiculously large fabric stash. Her style is more modern than not, though She’s dabbled a bit in just about everything. Your weekend treat: Quilty Box! Happy Friday! As a reward for making it through the week, we here at Pellon® wanted to give you a little something special as you head into your weekend. This week, we were lucky enough to sit down for a virtual interview with Patrick Claytor, the owner of the up-and-coming Quilty Box! We love to be on top of industry trends, and we immediately fell in love with the idea of Quilty Box. Seriously, who wouldn’t want a box filled with the latest and greatest craft and hobby products, all delivered to your front door? Yes, it’s true. With Quilty Box, every month feels just like Christmas! We wanted to give you all the secrets, details, and sign up information so you can experience how amazing Quilty Box is too! If you’re already a subscriber, you received a sample of our 100% Natural Cotton Batting in your August box. If you sign up now, you might see a few of your favorite Pellon products in the near future! Pellon: Can you tell us a little more about Quilty Box and how it works? Patrick: Quilty Box is a monthly subscription box full of quilting awesomeness. Each month we have a guest designer or blogger curate a surprise box of 4-5 products. We pack the boxes and ship them all out on the 11th of the month. Every subscriber receives the same products for that month. Our subscribers are introduced to new products, new techniques, and new designers. We encourage our subscribers to try every product in the box and share their creations on social media to inspire others. Pellon: What inspired you to start this business and how did it all come together? Patrick: I grew up in a quilting household. I learned to drive by running my mom around quilt shop hops. My mother is always working on a quilt and her creations fill my house. Every milestone in my life has been marked by a quilt: from my high school and college graduations, to my wife’s graduation, to our wedding. I know how much time and passion go into creating a quilt and I enjoy helping quilters expand their skills and their stash. Monthly subscription boxes are a great way to discover new products. I’ve subscribed to a few different boxes and was looking for a gift for my mother for Christmas. Unfortunately there were no active quilting subscription boxes, so I contacted the previous owner of Quilty Box and it has been a rollercoaster since. I thought this would be a great opportunity for my family and a great way to help quilters. Since June, we have helped hundreds of quilters Get Quilty. We’ve shipped boxes to all 50 states, Guam, Great Britain, Canada, Australia, New Zealand, Germany, Sweden, Japan, and the Netherlands. We are excited to continue to grow and to continue to help more quilters Get Quilty. Pellon: What’s your favorite thing about Quilty Box? Patrick: My favorite thing about Quilty Box is talking with all the great subscribers. It excites me when they tell me that “receiving Quilty Box is like waiting for Christmas.” And, it warms my heart to see what they create using the products they’ve received. We have a great group of people who like to post their projects on Instagram. Pellon: What is some of the best feedback that you’ve heard from your subscribers? Patrick: Our subscribers are great! They have been continuously giving us feedback on how we can improve. They’ve given me theme ideas for future boxes, they’ve clued me into great products, and they helped us improve our process. In the end, we do this for the subscribers, so their feedback is critical to our success. Pellon: Is there anything exciting on the horizon for Quilty Box and your subscribers? What can we expect to see in the future? Patrick: We have been planning many exciting things for Quilty Box. We should have a new website in a few months. We’re looking at improving how gifting works. And we are planning different styles of subscriptions. So, whether you are a traditional quilter or a modern quilter, you’d only receive products in line with those styles. And lastly, my wife and I are going to Quilt Market in Houston this October so we can meet many great suppliers and manufacturers to build relationships that will benefit our subscribers. Pellon: We love that you work with Quilts for Kids, an organization near and dear to us here at Pellon. Can you tell us a little about your involvement with them? Patrick: I decided to help Quilts for Kids because I know the impact of a quilt. A quilt is a very unique and personal item. It is made with time and care and love. It warms the heart and the soul and becomes a keepsake to the kids who receive one. We donate 5% of the profits of multi-month subscriptions to Quilts for Kids. So far our only involvement has only been monetary donations. I have had a few conversations with Linda on how we can help in a more meaningful way and we both have many ideas. The best way for now though is to sell more multi-month subscriptions and encourage our subscribers to make a quilt and send it to Quilts for Kids. Here’s all the vital information you’ll need to know to start receiving your very own Quilty Box! Types of Subscriptions Available: We have a month-to-month subscription and 3-month, 6-month, and 12-month prepaid subscriptions. All of our subscriptions are auto-renewing but subscribers can cancel their renewal anytime or skip a renewal. We offer gift subscriptions of 1, 3, 6, and 12 months which are not auto-renewing. Schedule: We ship on the 11th of each month. If a customer subscribes on or before the 10th, they will receive that month’s box. We ship 2-day USPS shipping so the boxes show up on doorsteps around the 15th. Our renewals occur on the 21st of the month. Quilty Box – Pellon Batting Love! Open to International subscribers? : Yes and we are excited to ship anywhere in the world. Shipping to Canada is an extra $10/box and anywhere else is $20/box. We are working hard to bring down our shipping costs for our international subscribers. We want to see what you make with the items in your Quilty Box this month! Tag us @pellonprojects on Instagram and show us how you use all of these great products and our 100% Natural Cotton Batting to ‘Get Quilty’! The Wonderful World of Fiber Fill! In case you missed last week’s post, we’re working on a 4-part series on great new projects to make using some key sale items at your local Meijer Stores. Last week, it was all about pillows. This week we’re looking at fun stuffed projects that require using a bit of fiber fill rather than a fixed size Pillow Form. From pin cushions to floor poufs, nursery mobiles to baby dolls, the project uses for fiber fill are endless. It is incredibly versatile and really supports a tremendous amount of creativity. There are so many fun projects out there, but we’d also love to see what you might come with on your own! The FiberFill: Pellon® Perfect Loft® Cluster Fiber Fill, Forever Loft Natural Latex Fill, & Basic Fill. Head on over to your local Meijer to grab a few at 25% off — the sales lasts for one more week, until February 12! In case you need just a bit more inspiration, check out our ‘Sewing: Stuffed!‘ Pinterest board. Something is bound to catch your eye! Head on down to Meijer, grab some fiberfill** and update your home today! We can’t wait to see what you make! ** Assortment may vary by store. With rows upon rows of booths featuring the hottest crafting tools, classrooms filled to the brim with students eager for a hands-on experience, and networking events geared toward expanding professional reach while building new and lasting relationships, the Craft & Hobby Association’s MEGA Show is truly the DIY enthusiast’s playground. The event brings together the best of the best in the trade and offers countless opportunities to learn, create and educate. While we won’t be exhibiting, you’ll still see our products around and you’ll even have the opportunity to try a few out thanks to our friends at Fabric Editions and renowned designer Rebekah Meier. We’ll be sharing a sneak peek with more info on Saturday morning, so stay tuned! Please note that this show is trade only. We know that leaves a bunch of you readers out, so we’ll share photos and updates when we can to keep you in the know! ** Welcome image shown is for the 2015 show. All other images are from CHA Mega Show 2014. Images are courtesy of CHA. Say hello to our new 90″ width batting, now available at your local Walmart! Our Nature’s Touch™ & Quilter’s Touch™ batting is the same high-quality batting you’ve come to love with a brand new width. A typical queen-sized quilt is 90″ x 108″. When you buy 3 yards you’ll have enough for a queen…How handy is that? 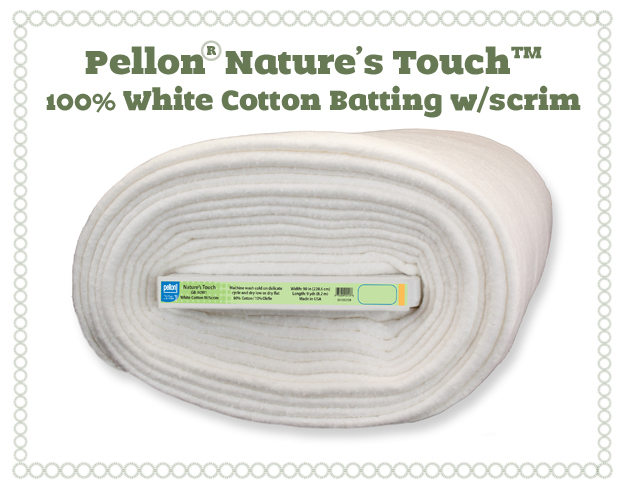 Nature’s Touch™ 100% Natural Cotton Batting with scrim is made of 100% Ultra Clean Cotton fibers which provide softness and durability. Quilters and crafters trust and love natural cotton due to the time proven qualities it lends to all projects. Cotton shrinks 3-5% [pre-soak as needed). The lightweight and soft stabilizing scrim binder provides strength and allows for a stitching area of up to 8-10″ apart. Nature’s Touch™ 100% Natural Cotton Batting with scrim is made of 100% Ultra Clean Cotton fibers which provide softness and durability. White cotton is ideal for light colored quilts as it reduces the risk of show-through. Cotton shrinks 3-5% [pre-soak as needed). The lightweight and soft stabilizing scrim binder provides strength and allows for a stitching area of up to 8-10″ apart. Quilter’s Touch™ 100% Polyester Batting is soft yet durable and provides an ideal loft that quilters and crafters trust and love. Siliconized Polyester has time proven features that provide loft and definition to projects. Polyester shrinks 0-3% [no need to pre-soak]. The lightweight and soft stabilizing scrim binder gives strength and allows for a stitching area of up to 4″ apart. Questions? Ask us!! Ready to get started? Find your local Walmart and grab your supplies now! We’re super excited about today’s post as it marks a fabulous new relationship with Birch Fabrics. We love their collections and are especially taken with Fort Firefly by Teagan White. The colors are perfect for the coming Fall season and the illustrations hint at fairytales and wonder. We’ve got a fun project coming for you later this week with a few of these fabulous prints, but were also thrilled to collaborate with Birch on another project by one of their designers, Christina McKinney. Not only are these little nested fabric bins adorable, they are incredibly functional. They would be perfect to spruce up your office, for extra storage in the baby’s room, for special events and more. Christina’s tutorial is super easy to follow and uses a simple combo of Fort Firefly fabrics and Pellon® 809 Décor-Bond®. For the full tutorial, visit the Birch Fabrics blog here. We’d love to see what you make, so be sure to post a photo on our Facebook page OR share with our ‘Made with Pellon®‘ flickr group! 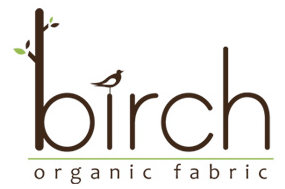 Birch Fabrics was created in an effort to provide an environmentally friendly cotton alternative to the quilting and crafting community. We at Birch Fabrics believe that the sustainability of our planet begins with consciousness, and can be successful with real action. That’s why our fabric is produced from 100% organic cotton, and printed with low impact dyes. Welcome to Pellon Projects™! We are SO excited to finally have a creative outlet through which to promote the quilters, sewers and crafters that we so dearly love. If you haven’t had a chance, head to our full website to explore the wide variety of projects available for free download. The projects are contributed by artisans who love Pellon® products. They make beautiful things and share them with us so that we can share them with you! We hope that the site will serve as a source of inspiration for you, your friends and your family. Have a question about a project or one of our talented artists? Let us know. Interested in becoming a Pellon Projects™ artist? We’re always looking for new talent, so drop us a line here! More than anything, we want to hear what you think. Tell us about your favorite fabrics, interfacings, sewing machines and more. What about crafting and quilting gets you excited? Who inspired you to get started? We love a good story! !